​Eszter and Keith have been a part of our GAGC Family and has supported us for years. They recently lost their female greyhound, Jazzy and poor Kylie really missed having a friend. Eszter called me and said they were ready to add to their family. Her daughter Zoey came to meet the 3 dogs they were interested in. After much deliberation they couldn't decide on just ONE, so they adopted Kind Spirit and Catchthewind! Kylie definitely liked the males over the female she met. AND instantly liked Catchthewind. 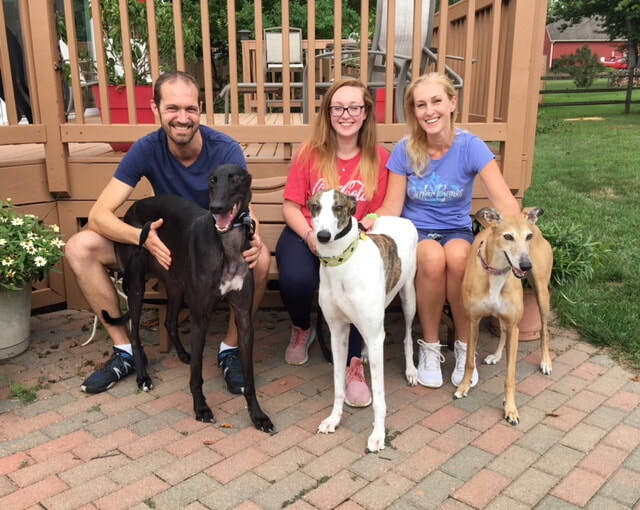 Knowing Catch needed a home that knows greyhounds, they were up for the challenge in helping him build his confidence! They are keeping the name his foster family called him "SPOOKY" and Kind Spirit is now called Coop! So this was a greyt day and these two boys are going to make Kylie VERY happy again.